valdepeñas | Vinya IVO: S'Alqueria, Pirata, Cadaqués. Samedi… travail le matin, puis je retrouve vers 13h00 Joan & Barbara. Joan est Català « i prou »….. Barbara Anglaise ! Ils ont une trés belle maison à cheval entre Port-Lligat et S’Alqueria: « Ses Vistes« . Ma fille Giulia avais déjà était reçue chez eux cet été. Vue avec fond le... Vista con El... View with.... El Cap Creus ! Je profite donc de mon séjour londonien pour se connaitre ! Nous allons au pub a pied: Ladbroke Arms. Good pub in front of the Police station ! Holland Park- Notting Hill : 10 minutes de marche. Le pub est presque plein… le service particuliérement long… mais cela fais partie du style de vie… personne ne s’affole ! A Barcelona, Bilbao, Milano, Madrid, Paris,… n’importe quel pays latin, on aurait appelé 10 fois le serveur ! Bien sur je suis chargé de choisir le vin pour le repas. Pas un vin de l’Empordà, pas un vin Català, sur la carte…. je choisis donc un Valdepeñas Réserva, assez typé et bon. Nous parlons de tout et surtout de notre passion pour notre terre, notre village: Cadaqués. Aprés ce lunch nous décidons de nous revoir bien évidemment … à Port-Lligat et dés ce mois de Novembre ! 16h00: Déjà. Je rentre chez moi, prends mes bagages et file a Saint-Pancras retour pour S’Alqueria avec encore quelques escales en route ! J’ai des commandes à préparer, puis je reprendrais mon bâton de pèlerin ! Saturday… work in the morning then catch up with Juan and Barbara at 1.00. Juan is catalan, Barbara English! They have a beautiful house right between Port-Lligat and S’Alqueria: « Ses Vistes« . My daughter Giulia already went to see them this summer. I make the most of my stay in London to get to know them better. We walk to The Ladbroke Arms. Good pub in front of the Police station ! 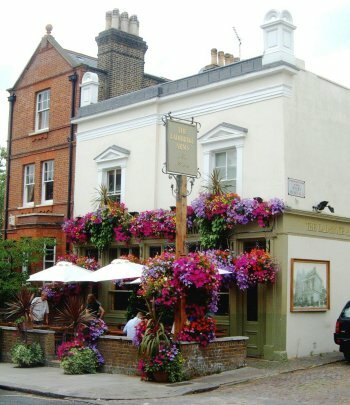 Holland Park – Notting Hill and 10 minutes walk. The pub is pretty full, the service pretty slow but that’s all part of it – nobody seems bothered. In Barcelona, Bilbao, Milan, Madrid, Paris,….. of any other southern country, the waiter would have been called at least ten times! I am obviously asked to choose the wine to go with lunch. Not one wine from Empordà, not even a catalan wine on the list … I choose a Valdepeñas Reserva, typical flavour and good. We speak about anything and everything and in particular our shared passion for our land, our village: Cadaqués. 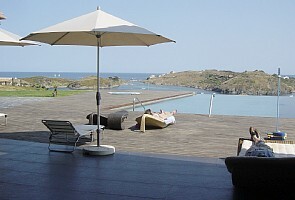 After lunch we arrange to meet up again … at Port-Lligat in November! 4pm already. I set off, get my suitcases and head for Saint-Pancras to go back to S’Alqueria with a few more stop-offs on the way. I have orders to prepare before I pick up my pilgrim’s staff again!